This is a high-quality wireless car charger,which has Ultra-fast charging,Stable and Secure, One-hand easy operation,suitable for air vent.That is your phone's good partner in your car! Faster Wireless Charging--Fast Charge Mode enables wireless charging up to 2x faster. 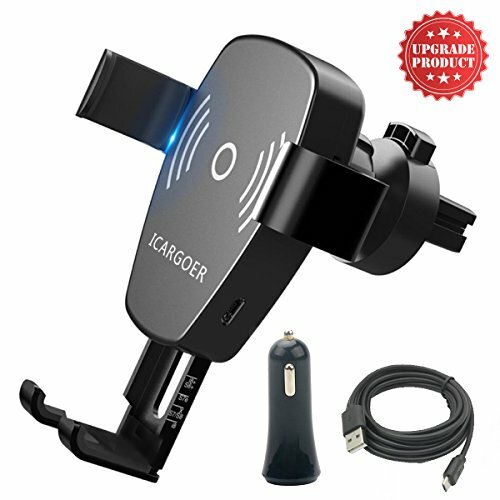 The upgraded version 2.0 car charger provides 10W(for Samsung quick charge compatible devices like Galaxy S8, S8 Plus, S7 Edge, S6, Note 8, Note 7, Note 5) and 7.5W (for iPhone 8, 8 Plus, X above iOS 11.2). Fast wireless charger keeps your phone with enough power while GPS always working. Advanced Safety Features--Quick Changer 2.0 technology provides temperature control, surge protection, short-circuit prevention, and more advanced safety features, keeping you and your devices safe. LED indicators, non-slip pad, and compact build ensure simple and convenient charging. One-handed easy operation--This car wireless charger with Gravity and Linkage Design---just put your phone into it, the two arms will automatically grip your phone tightly.The triangle design of the charging dock and the size-scale design of telescopic arms,ensure that your phone battery can be completely consistent with the center of the coil,make sure that your phone will not be fallen down or stopping charging for every bumps during driving. Aluminum alloy material--This car wireless charger made of aluminum alloy material,definitely not cheap poor plastic material, very strong, not fragile.Silicon protection design on the telescopic arms and air vent clamp, could prevent damages and scratches of your phone and the car's air vent. Installation and Warranty--Cradle installation type--- Air Vent only. Air vent installation way helps cool down your phone while charging.We offer 12-month worry-free warranty and friendly customer service. If you have any questions about this product by GZHUA, contact us by completing and submitting the form below. If you are looking for a specif part number, please include it with your message.